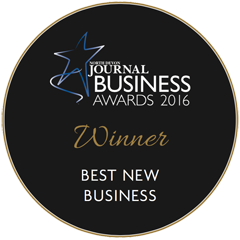 The Gardant Team was delighted to win the Best New Business category in the North Devon Journal Business Awards 2016, presented at the Highbullen Hotel on 5 May, in front of an invited audience of 200 of the region's leading business people. Oliver Backhouse, Operations Director, commented: "It was a great night for us. 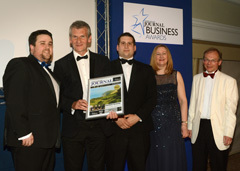 As well as winning Best New Business, we were a finalist in the Small Business of the Year category." The award caps an exciting first two years for Gardant. Founded in January 2014, the business has attracted sector-leading clients in solar construction and leisure. Steady growth has resulted in the business achieving £1m annualised turnover at the end of its second year and the directors look forward to further success and diversification into retail and corporate security. From the outset the directors have set out to create a security business that would 'change the game', setting the highest standards in the industry; standards that have been recognised with the awarding of the Security Industry Authority's Approved Contractor Scheme status and ISO 9001 in 2015. Colin Farrow, Finance Director, reflected: "Gardant is a young business with an old head on its shoulders. By deploying highly experienced officers working to best practice standards, we aim to deliver the best client assurance levels in the industry." 2016 has seen further progress against the strategic plan, with new client wins in leisure and construction and Gardant's entry into the retail security market. Gardant directors Colin Farrow and Oliver Backhouse receiving the award from Rich Evans of category sponsor Bluefrog Media.